Check these latest details about UP Panchayat Sahayak Recruitment 2019 to be conducted by the Uttar Pradesh Panchayati Raj Department, Lucknow. All the state aspirants need to know that the state government has decided to come up with Uttar Pradesh Panchayat Raj Bharti Notification 2019 in the forthcoming days. Kindly, read down the page and avail the further details to start applying and register for the selection process is to hold very soon. Uttar Pradesh Panchayati Raj Department is a state government authority to undertake the rural affairs of the state. Following the current recruitment notice, there will be the selection of eligible candidates for the posts of Panchayat Assistant, Accountant, Junior Engineer, and Computer Operator in several departments. All the desirous applicants need to read through every detailed mentioned here and fill their online registrations for the current and future employment opportunity. Get ready to apply for approximate 9000+ vacancies in the state departments. The structure of placement and application along with registration process is via online method. The details regarding this year’s placement and applying process are given below. Final date to apply is to be given along with the official UP Panchayat Sahayak Recruitment 2019 advertisement. Read on and avail more relevant news here and fetch all the information. Know the in-depth information about Uttar Pradesh Panchayat Sahayak Bharti Notification 2019. Find out job details along with the eligibility criteria, educational qualification, fee applicable, and salary defined for these vacant positions. Also, look at the instructions required to apply for the upcoming recruitment. For Panchayat Assistant Posts: an applicant needs to have completed diploma in Civil Engineering and must hold an experience of 3 years. For Computer Assistant Posts: The minimum education required is 12th (Intermediate) from a recognized board with a CCC certificate from NIELIT and a minimum of 3-year experience. For Accountant Posts: An applicant needs to have done B.Com from a recognized University with a CCC certificate from NIELIT with a 3-year work experience. For JE Civil Posts: a diploma or Degree in Civil Engineering is the minimum requirement for this job with three years of working experience. The lower age limit to apply for these jobs is 18 years while the upper age limits are extended to 40 years. Note: Age relaxation is to be given to the reserved categories as per the state government norms. The applicable charges vary according to the category of the job profile. Payment Mode: Online Banking, Credit/Debit (VISA/Master/Maestro). A Written Test will be followed by an interview. For Panchayat Assistant, it is Rs. 8000/- per month. For Junior Assistant (Civil), it is Rs. 20, 000/- per month. For Accountant posts, it is Rs. 15, 000/- per month. For Computer Assistant vacancies, it is Rs. 9000/- per month. After landing on the homepage, find the latest news and notification segment. Look for an updated job notice and follow it to get to the official announcement. Download it and read it very carefully to fetch all the relevant details. Start applying online after getting down to each point and choosing the specific job profile. Fill the application form as instructed and complete the application process. Pay the application fee and upload the images in the specified format. Review your submitted information and generate a printout of this form. Keep its copy safe for a future reference. 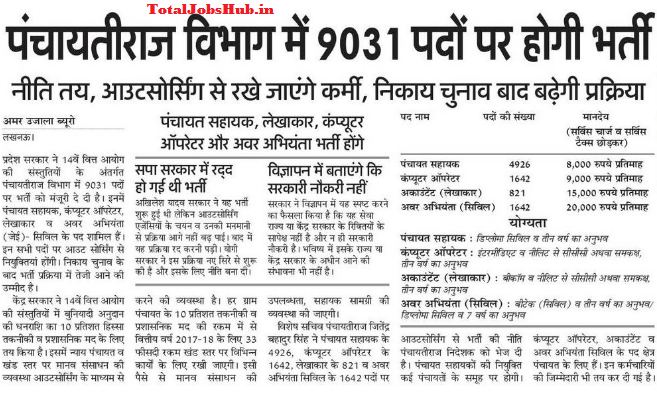 The team of Totaljobshub.in with all the candidates Best of luck for UP Panchayati Raj Recruitment 2019, UP Panchayat Sahayak Jobs Notification for 9031 Positions. Hope you will get each and every single information on this web page regarding UP Panchayati Raj Vacancies. Read more in details about UP Panchayat Sahayak Recruitment 2019 here and visit the official link mentioned in the end. Please refer to the main notification available at the same website and collect more information before applying.